Sign up to Dry July Australia 2018 and raise funds for Dry July Foundation Supporting SA. Money raised will go to organisations in South Australia which offer cancer support and treatment services. Funds are awarded following a grant application round in late October each year. •	RESTORE Cancer Wellness Program at Calvary North Adelaide Hospital and Calvary Central Districts Hospital’s cancer centre. The program offers complementary therapy during treatment and educational workshops for people newly diagnosed with cancer. We have announced the 41 recipients of this year’s Dry July Foundation Grant Program as part of the 2016 Dry July campaign. 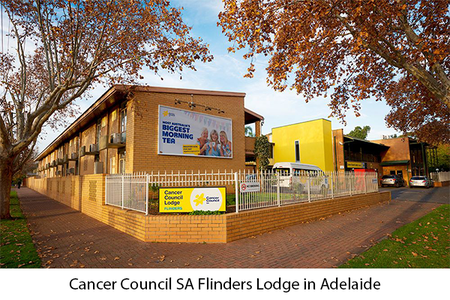 In South Australia, The program funded projects for 4 recipients to benefit those affected by cancer. In 2015 Dry July awarded a grant to Cancer Council SA to refurbish the dining room at Flinders Lodge. New tables, chairs and stools were installed. This communal area was in need of a refresh after 20 years of use! The stress around undergoing cancer treatment can be enormous, particularly when out of your own surroundings. Thanks to the generous efforts of supporters of Dry July Foundation Supporting SA in 2015, guests at Flinders Lodge can now feel a little more comfortable while away from home. It’s little things like this that could make the world of difference to someone who is already enduring the fight of their life. A big thank you to all who made this happen. The Dry July Foundation has awarded a grant to Flinders Medical Centre Foundation for furnishings in the (Dry July funded) new patient space on the ground level of the Flinders Centre for Innovation in Cancer (FCIC). Works for completing the refurbishments to this space are finally underway in the Centre and we look forward to showing you the new space soon! The grant will be used for the purchase of sofas, armchairs and coffee tables to make patients utilising the space a little more comfortable. Cancer Council SA provided the venue, publicity and free transport if guests needed to attend at an alternative site. From July 2016, Cancer Council SA will be modifying the program to develop an activity to encourage guest participation in a fun and interesting way that also encourages activity and decreases sedentary behaviour - such as a series of group or self-guided walks around the Lodges.